The artist has stated that removal of the graffiti and structural stabilisation were priorities in its conservation (Cuppaidge 2018 pers. comm. 1st March). These expectations were incorporated into our treatment aim. However, the porosity, solubility and proprietary formulations of Liquitex® Acrylic Paints required alternative treatment methods to protect the original materials. This effect is what Cuppaidge was aiming for with her thin layers of paint and large-scale works. 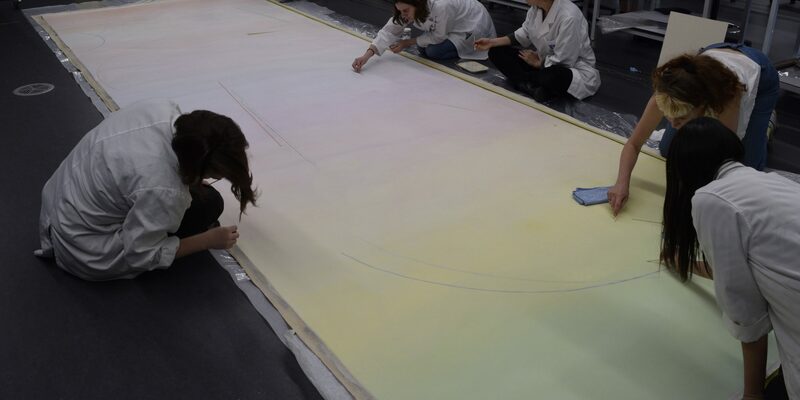 However, the technology that permitted this process also introduced inherent vice within the paint film. The drying process that allows application of multiple paint layers also results in a porous paint film. This porosity both makes it vulnerable to swelling and pigment extraction through cleaning (Dillon, Lagalante & Wolbers 2014, p. 54: Ziraldo et al. 2016, p. 210). The penetration of moisture into the paint film also lowers the temperature at which the film becomes tacky, also called the glass transition temperature. Increased tackiness makes it vulnerable to picking up dirt at room temperature (Ziraldo et al. 2016 p. 210). Surfactants included in the paint formulation also predispose the paint film to dirt retention and flexibility. Surfactants act as wetting agents and stabilise the incompatible components of the emulsion. Once in the paint has dried, however, they react to moisture and temperature by migrating through the pores in the paint film, drawing surface dirt inwards (Croll 2006, pp. 21-20: Ormsby & Learner 2014, p. 59: Ziraldo et al. 2016, p. 510). Investigations into methods of aqueous and solvent cleaning indicate that surfactant extraction is inherent to cleaning and can embrittle the film and increase its glass transition temperature (Ormsby et al. 2006, p. 194). Dry methods and localised aqueous treatments through swabbing have proven to be the least extractive, having negligible effect on the properties of the bulk film (Ormsby et al. 2006, p. 189). A novel method of treatment had to be devised due the lack of reversible treatment methods and materials for large-scale acrylic paintings (Smithen 2006, p. 173). Mars Staedler® erasers, composed of PVC and diisooctly phthalate (Daudin-Schotte et al. 2012, p. 211), was chosen after extensive of materials testing. 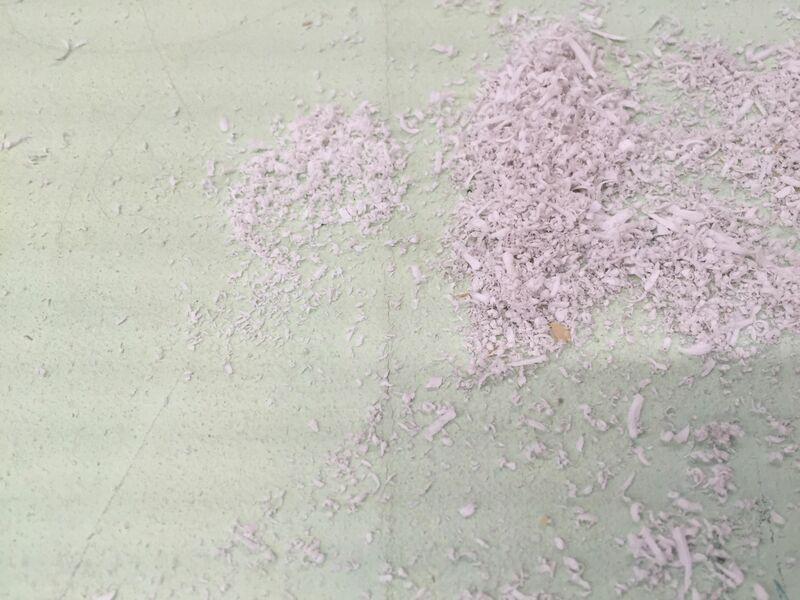 Using the erasers did not leave a visible residue, and could be grated to create a cleaning powder that could be rubbed on the surface using a microfibre cloth. Comparing new and used shavings made evident the dirt pick up, and the painting was cleaned once overall, and a second time, which targeted the dirtier half. Figure 3: Dry cleaning of top of Cytheria using grated Mars Staedler® erasers, microfibre cloths and goat hair brushes. Photographed by Catherine Gill. 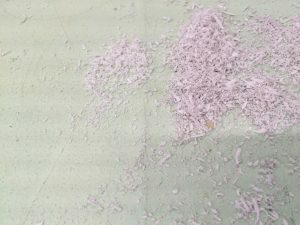 Figure 4: Image of used eraser shavings compared with new eraser shavings indicating dirt pick up. Photographed by Lily Bennion. A localised aqueous clean, tailored to the surface pH and conductivity, was used to minimise surfactant extraction and swelling of the paint. A variety of solutions were tested, with chelating agents EDTA, DTPA and citric acid to target the surface dirt. In addition, gels such as Xanthan Gum and methylcellulose were trialled to control moisture penetration into the painting. The residue from these solutions were then removed with a clearance solution. This clearance solution was tailored to pH6, which matched to the average surface pH, and the ionic conductivity of the solution was lowered to 1000 µS/cm, to match that of acrylic paint (600-1000 microseimens/cm) (Wolbers & Stravoudi 2012, p.501; Dillon, Lagalante & Wolbers 2014, p.58). This method was considered as effective as those with additives, and was considered risk adverse as it introduced little new material to the surface. This aqueous solution was applied with a swab, and removed immediately with a dry swab to minimise contact time, thus minimising the risk of altering the surface. The system effectively removed food and beverage stains and reduced the visual impact of the water staining. Figure 5: Detail of aqueous cleaning. Photographed by Catherine Gill. Cleaning graffiti off of the artwork had additional challenges. First, the original paint and the graffiti were soluble to the same solutions. Second, cleaning could cause the migration of the added materials into the paint film. Lastly, solvent cleaning could lead to swelling and blanching. Because of these risks, we concluded that reducing the impact of the graffiti through aqueous clean rather than complete removal was a wiser route. A similar decision was made in the conservation of the Michael Johnson’s work, which possessed similar conceptual and medium specificities. Johnson’s work was therefore not solvent cleaned, and retouching was pursued instead (Dredge 2015, pp. 136-146). In this instance, integration of the graffiti through retouching was recommended for future treatment. 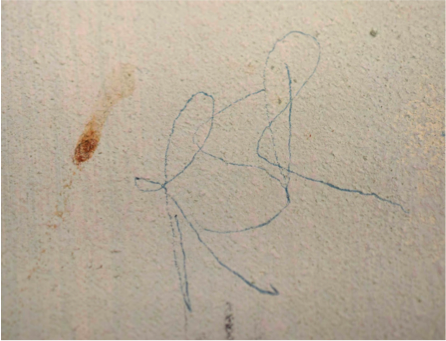 Figure 6: Detail of graffiti and food stain before treatment. Photographed by Catherine Gill. 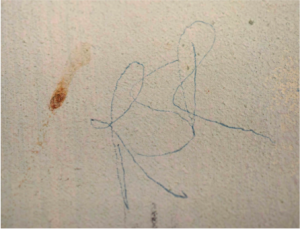 Figure 7: Detail of graffiti after dry and wet cleaning treatment. Photographed by Catherine Gill. 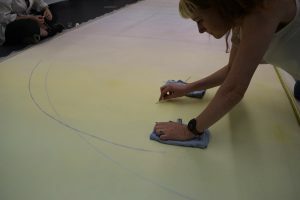 Correspondence with the artist revealed that she worked with large width cotton duck canvas stretched onto tailor-made lightweight stretchers that she could lift onto the wall herself (2018 pers.comm. 1st March). This method used the full width of the canvas and left barely enough material for a sufficient tacking margin, as is seen in a number of American works from the time (Young 2012, p. 145). These light weight stretchers did not possess a wide enough profile to withstand the tension distributed across the large picture plane. As a result, the canvas tacking margins had warped and scalloped at the staple points at which (Booth 1989, p. 33). Vertical cracks were evident along the picture plane, indicating the location of the braces behind, and impact cracks, with a concentric circle configuration, were littered throughout the composition, indicating a slackening of the canvas (Booth 1989, pp. 31-2). 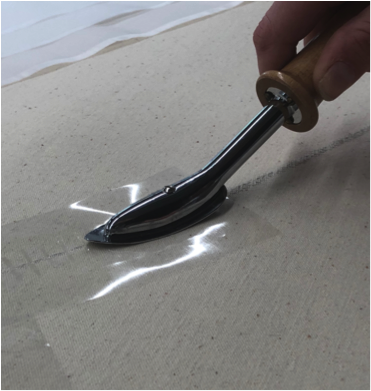 The attachment of a strip lining along the tacking margin allowed for a wider stretcher to be used, alleviating some of the tension held in the painting (Levenson 2012, p. 409). 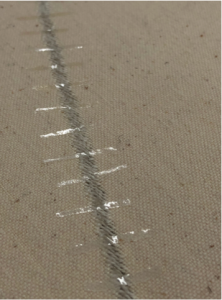 Figure 8: Heat setting BEVA®371 film into polyester sailcloth using tacking iron. Photographed by Catherine Gill. 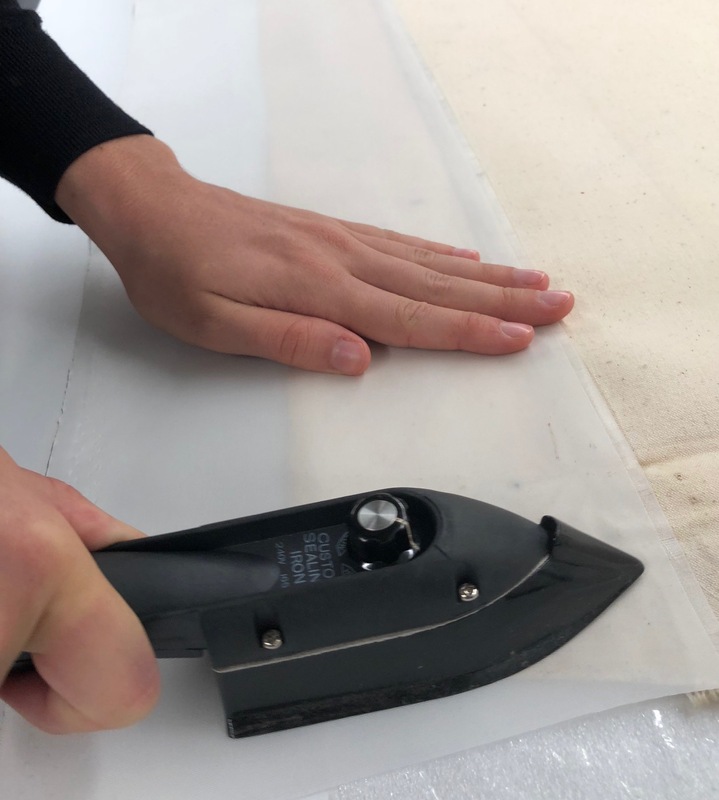 The fabric chosen for strip lining was a multi-filament polyester sailcloth heat set to preserve its shape, which also provided the dimensional stability, stiffness and isotropy required of a lining material (Young 1999, p. 84). The fabric was then adhered with BEVA®371 film, which can be set at 65C using a heated spatula (Berger 1975, pp.126-7). During heat setting, the large tear in the artowork’s bottom left was stabilised with a polyamide suture. These sutures are meant to ensure the cotton duck does not deform and create a wider rift before a thread by thread repair can be pursued (Heiber 2003, p. 36). This is a reversible measure, as the sutures can be mechanically removed in the future. Figure 9: Polyamide repair using heated spatula. Photographed by Catherine Gill. Figure 10: polyamide repair after treatment. Photographed by Catherine Gill. 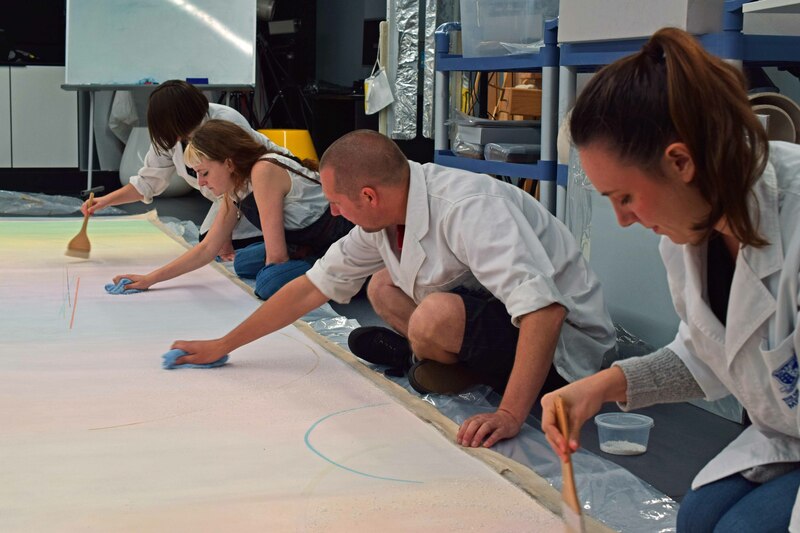 Treatment on Virginia Cuppaidge’s Cytheria is to continue at the Grimwade Centre for Cultural Materials Conservation, and recommendations for further treatment include research into cleaning systems for acrylic paints, focusing on reducing the effect of the graffiti. 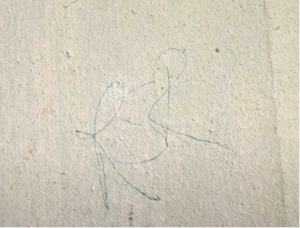 Now retouching of the remaining graffiti, and stabilisation of the tears will need to be looked at. Upon completion, Virginia Cuppaidge intends to donate the work to a state institution. Until that step is reached, it was recommended the work be stored in an unstretched state, rolled face up with interleaving protective material and polyethylene external wrapping (Dixon 2012, p. 676). Upon exhibition, it was recommended the work be stretched on either aluminium or cedar, for the structural strength and planarity. Both the storage and exhibition considerations are a result of the artwork’s immense size. Working on such a challenging painting involved accommodating the artist’s intent and conceptual innovations whilst considering the parameters of the original materials. Acrylic paints, and large-scale canvases, though possessing inherent vices, have allowed for innovative artistic practices and the realisation of conceptual intentions unachievable in the past. Conserving Cytheria thus involved developing an innovative approach to cleaning that was minimalist enough to reduce the risk of affecting the original materials, but effective enough to reveal the subtle gradients in colour that impose its sublime and meditative experience on the viewer. I would like to thank all my group members, Ellie Gifford, Hannah Stewart, Gloria Gamboz, Thomasin Bailey, Alexandra Taylor, Catherine Gill, Kim Vernon, Anastazja Harding and Madeline Ewing. I would also like to thank Virginia Cuppaidge for sharing her invaluable information with us, and Dr. Nicole Tse for the guidance. Berger, G 1975, ‘Heat-seal Lining of a Torn Painting with Beva 371’ Studies in Conservation, vol. 20, no. 3, pp. 126-151. Booth, P 1989, ‘Stretcher Design: Problems and Solutions’ The Conservator, vol. 13, no. 1, pp. 31-40. Croll, S 2006, ‘Overview Of Developments In The Paint Industry Since 1910’ T Learner, Smithen, P, Krueger, J, and Schilling, M (ed. ), Modern Paints Uncovered, Getty Conservation Institute, Tate and National Gallery of Art, Tate Modern London May 16-19 2006, pp. 17-29. Daudin-Schotte, M, Bisschoff, M, Joosten, I, van Keulen, H, & Jan van den Berg, K 2012 ‘Dry Cleaning Approaches for Unvarnished Paint Surfaces’ Smithsonian Contributions to Museum Conservation, no. 3, pp. 209-220. Dillon, C.E, Lagalante, A.F, & Wolbers, R.C 2014, ‘Aqueous cleaning of acrylic emulsion paint films. The effect of solution pH, conductivity and ionic strength on film swelling and surfactant removal’, Studies in Conservation, vol. 57, no. 1, pp. 52-62. Heiber, W 2003, ‘The Thread-by-Thread Tear Mending Method’ Alternatives to Lining Workshop, London: Courtauld Institute, pp. 35-47. Levenson, R 2012, ‘Strip lining, loose linings and other alternatives to overall linings’ in Stoner, J & Rushfield , R (ed. ), Conservation of Easel Paintings, Routledge, London, pp. 408-414. Ormsby, B, Keefe, M, Phenix, A, Von Aderakas, E, Learner, T, Tucker, C, & Kozak, C 2016, ‘Mineral Spirits-Based Micro Emulsions: A Novel Cleaning System for Painted Surfaces’ Journal of the American Institute for Conservation, vol. 55, no. 1, pp. 12-31. Ormsby, B, & Learner, T 2014, ‘Artists’ acrylic emulsion paints: materials, meaning and conservation treatment options ‘, AICCM Bulletin, 34, pp. 57–65. Ormsby, B, Learner, T, Foster, G, Drusik, J, & Schilling, M, 2006 ‘Wet Cleaning Acrylic Emulsion Paint Films: An Evaluation Of Physical, Chemical And Optical Changes’ in Learner, T, Smithen, P, Krueger, J, & Schilling, M (ed. 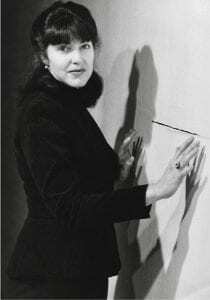 ), Modern Paints Uncovered, Getty Conservation Institute, Tate and National Gallery of Art, Tate Modern: London May 16-19 2006, pp. 189- 200. Smithen, P, A 2006, ‘A History of the Treatment of Acrylic Paintings’ in Learner, T, Smithen, P, Krueger, J, & Schilling, M (ed. ), Modern Paints Uncovered, Getty Conservation Institute Tate and National Gallery of Art, Tate Modern: London May 16-19 2006, pp. 165-174. Wilkin, K 2007, ‘Notes on Colour Field Painting’ The New Criterion, October, pp. 44-46. Wolbers, R, & Stavroudis, C 2012, ‘Aqueous methods for the cleaning of paintings, ‘ in Stoner, J & Rushfield,R (ed. ), Conservation of Easel Paintings, Routledge, London, pp. 500–24. Young, C 2012, ‘History of Fabric Supports’ in Stoner, J & Rushfield,R (ed. ), Conservation of Easel Paintings, Routledge, London, pp. 116-150. Ziraldo, I, Watts, K, Luk, A, Lagalante, A.F, Wolbers, R.C 2016, ‘The influence of temperature and humidity on swelling and surfactant migration in acrylic emulsion paint films’, Studies in Conservation, vol. 61, no. 2, pp. 209-21.